Why start a Mood Chart? 1. 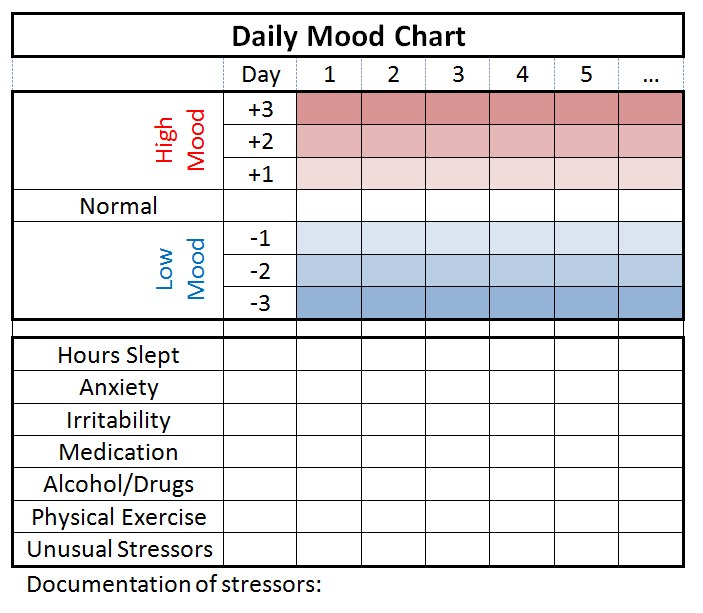 Mood charting allows us to better connect treatment recommendations with not only a person’s current mood but also where there mood is likely to be heading. 2. Regularly recording moods can increase an individual’s awareness of changes in mood. 3. 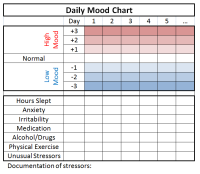 The mood chart can help an individual understand what factors are causing particular changes in mood. 4. Mood charting can prevent a large mood episode from occurring. By tracking daily moods, a person can react more quickly to mood changes and regain control. 5. Writing down this information each day gives an individual a detailed account of the feelings and occurrences experienced in daily life. This makes it easier for people to relay important information that doctor’s need to determine the best treatment strategies. What do you write in your Mood Chart? To bed: What time did you go to bed the night before? Out of Bed: What time did you wake up the next morning? Sleep hours: How many total hours of sleep did you get? Mental Speed -5 to 5: How is your concentration? Sensitivity 0-5: How irritable are you feeling? Outlook -5-5: How is your overall view on life at the moment? Are you feeling positive? Are you feeling negative? Medications: What is the dosage/current medication you are taking? Daily Notes: What did you do today? Who did you interact with? What were you feeling? The Senti app keeps an emotional history of everyday life by asking questions about the day and feelings of that moment. It then compiles a summary and chart of your moods throughout the day. All of the information is handled with anonymity and privacy. Senti can average moods over the course of several weeks to show what your average mood is and the times when mood rises or falls. The note taking component of Senti allows individuals to write little blurbs about activities and feelings that correspond to a particular mood rating. A log of these notes helps users identify events or experiences that trigger certain moods. With this information, users have a better idea of what activities to seek and avoid. Senti not only asks questions about mood, but also asks about feelings in regard to purpose and personal goals. This app allows users to participate in mood-enhancing activities, identify and change unhealthy patterns of thinking, rate/chart moods over time, and create journal entries as a supplement to these ratings. Moodkit offers more than 150 mood improvement activities full of examples and tips. Because of the variety, this app is able to target more specific needs of different individuals. Similar to Senti, there are security features in this app, so that the information is private. One of the best features of Moodkit is Thought Checker. The Thought Checker feature calls users to first, write about a certain situation. Then, the individual must report initial thoughts and feelings about the event. Finally, the individual looks for common patterns and distortions within these thoughts. Once the user recognizes thought distortions, they report their current feelings and modify negative thoughts into more positive thoughts. I decided that I was going to start mood charting. I’ve been recommending it to others for so long that it only seemed fair that I do it myself. What I discovered is that it was important to connect the activity of charting to a sense of reflecting on the day. That way filling out the daily entry was a way of achieving a sense of peace and clarity about how things turned out. Peace and clarity. In other words, I needed to make mood charting an activity that was an exercise in mindfulness. If I didn’t do that then filling out the chart seemed like a moment to reflect on failures. And when I did that, I found that I enjoyed taking that moment at the end of the day to write a few notes and reflect on my mood and my sleep. Dr. Forster met with a patient named David that claimed he was “doing better than he should.” He felt that his overall mood was pretty good, but he was also experiencing difficulty with his memory and concentration. Dr. Forster and David used extensive mood charts David had been keeping. In his mood charts, David tracked his sleep, the quality of sleep , how much he was walking and running in terms of steps, productivity, sensitivity (distress in social situations), and more. After looking at David’s chart, Dr. Forster noticed that when David had stayed up late, he had talked to a coworker about a problem at work. This problem had caused David a lot of anxiety, and after solving the problem, David had an increased sense of productivity and had a more positive mood. The changes in David’s mood were thus, not related to lack of sleep, but instead a reflection of his increased productivity. Mood charting gave David a better understanding of his mood. It is a simple and effective way to better get to know how the different aspects of your life are changing the way you feel every day. Dr. Forster’s video about mood charting with David.